The stuffing looks very similar to the standard oyster stuffing we do for holiday turkey. 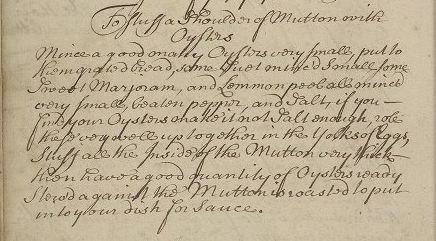 People assume that the oysters will make the dish fishy, but they don’t. Instead they give it a huge punch of richness. I haven’t tried using oyster stuffing with other meats, but now I will. Thanks for the inspiration! That’s such a nice connection. It makes the dish much more familiar. Let us know how your stuffing experiments work out!